Last week we talked about a cavity. When you have a cavity, that means you have a bad tooth. So you’d better go to the dentist right away and have your cavity filled. What about a sweet tooth. When you have a sweet tooth instead of a cavity, what does that mean? A sweet tooth is a craving or fondness for sweet food. If you have a sweet tooth, you like eating cakes and chocolates. Do you have a sweet tooth? Me? Maybe not. I do enjoy chocolates and ice cream from time to time. But I’m not a big fan of sweets. 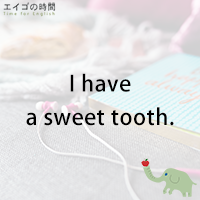 Now, make sure to say “you have a sweet tooth” not “sweet teeth’, even though you have a big appetite for sweet food. Now. Would you like to try a quiz? I’ll read three sentences. Please listen carefully and choose the one that is NOT TRUE. Ready? 1. Mary is crazy about cakes and chocolates. She has sweet teeth. 2. Mary is not a big fan of sugary food. She doesn’t have a sweet tooth. 3. Mary always wants dessert after a meal. She has a sweet tooth. Next Post すごく好きなわけじゃない – I’m not a big fan of sweets.